Grain-free never tasted better! These easy and super moist Paleo pumpkin chocolate chip muffins will satisfy your pumpkin spice cravings. Made with simple and healthy ingredients. Gluten-free, dairy-free, grain-free and no refined sugar. 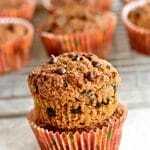 New and Updated Paleo Pumpkin Muffin Recipe! My husband and I have been eating more Paleo to help with his migraines and autoimmune inflammation and my thyroid and adrenal issues. Paleo simply means gluten-free, grain-free, dairy-free and no refined sugar. So, I have been experimenting with more Paleo recipes. As I have been baking more and more gain-free, I have created an improved recipe for Paleo muffins that my family prefers to the original muffin I posted in October of 2017. I have been baking a lot of Paleo muffins in a variety of flavor combinations because they are my husband’s go to for breakfast, snacks, and dessert. Seriously, I am baking Paleo muffins every other day. My husband and my kids love them and eat them so quickly that they usually don’t last more than one day. If you are new to grain-free baking, there are a few differences to traditional gluten-free baking with rice flour. Paleo grain-free baking is different than gluten-free baking, especially the texture. The texture of almond flour is much denser than baking with rice flour. Even though it’s different from your traditional gluten-free baking, it’s a tasty different. My favorite refined sugar-free options to bake with is either pure maple syrup, honey or coconut sugar. Some of my favorite dairy-free alternatives that I like to bake with is almond, cashew or coconut milk. I also like baking with coconut oil or Earth Balance or Smart Balance butter. 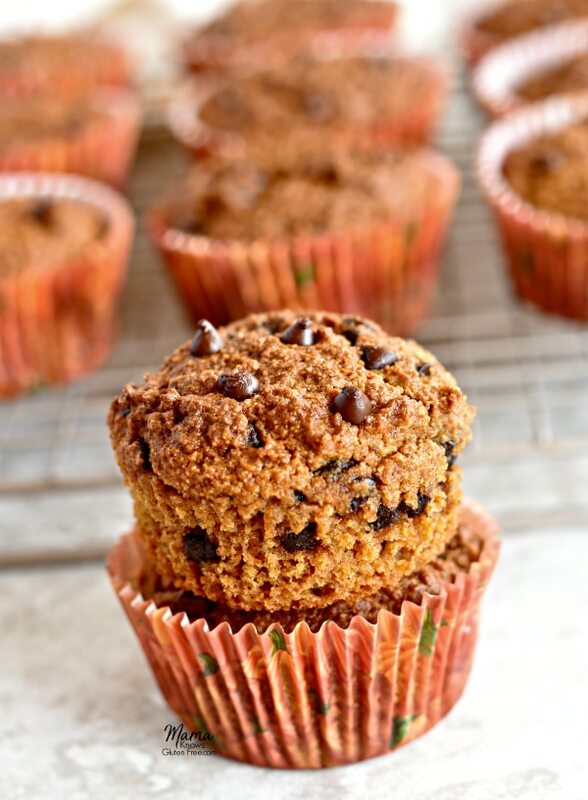 These Paleo pumpkin chocolate chip muffins are made with almond flour and are super easy to make. They are a one-bowl wonder that takes less than 40 minutes to make. 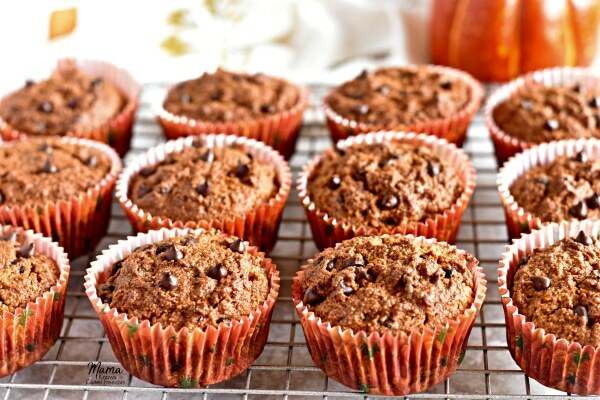 You are going to love how moist and perfectly spiced these grain-free pumpkin muffins are. I hope you enjoy them as much as my family does! Also, check out my other Paleo muffin flavors. Let’s Connect! 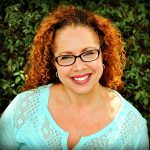 You can FOLLOW ME on Instagram, Facebook or Pinterest! In a large bowl add the wet ingredients first (eggs, pumpkin, pure vanilla extract, and pure maple syrup) and stir together to fully combine. Then add the dry ingredients (almond flour, baking soda, gluten-free baking powder, pumpkin pie spice, cinnamon and chocolate chips). Mix until fully combined. Bake for 26 minutes. Please watch your oven because all ovens are different. Remove and check centers with a toothpick to see if they are done. Did you make a recipe? Tag @mamaknowsglutenfree on Instagram, Facebook or @mamaknowsgf on Twitter! I would love to see what you created! 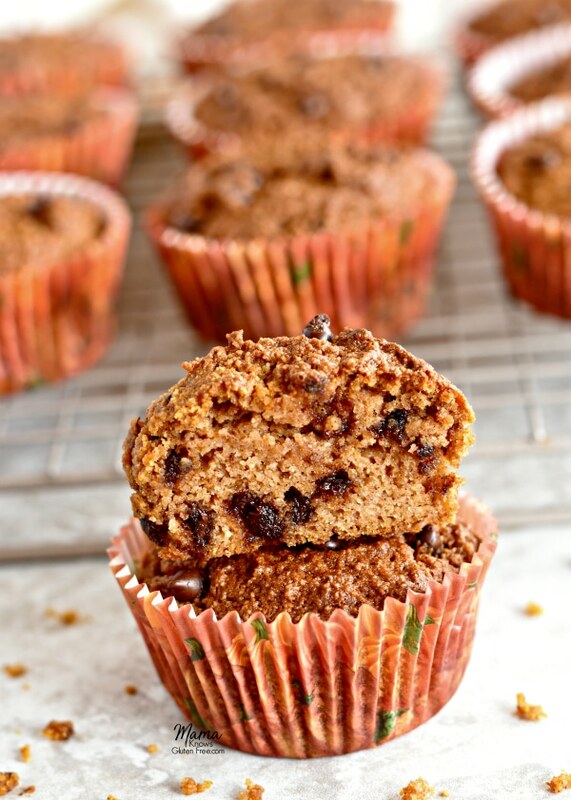 I absolutely love pumpkin muffins – these look so delicious! Thank you Marsha for the wonderful 5-star recipe review! Oooh yum. I can practically smell these muffins from here! Thank you so much Kate for the wonderful 5-star recipe review.